The Cargo Room is a room inside of the Old Clockworks in Luigi's Mansion: Dark Moon. The Cargo Room is accessed by taking the east doors on either floor of the Clock Tower Gate. When Luigi first enters, the Cargo Room has cracked cement, broken boards and pipes, and the windows are covered up. Activating the robot bomb fills the room up with sand, covering up most of the floor. There is a stairwell that can be brought down by yanking the chain. Luigi can look through a pipe here to get a glimpse of the Service Elevator. The doors to the left lead back to the Clock Tower Gate. The door to the right leads to the Service Elevator although this entrance is never used because the other side of the door is blocked by junk. During A Timely Entrance, when Luigi first enters the room, he should remove the cloth covering a window to reveal a Robomb. Activating the bomb causes it release sand and fill up the room. Professor E. Gadd calls Luigi and notifies him to make his way to the Drafting Office. Before Luigi can make his way to the second floor, a Greenie surprises Luigi, knocking him back to the first floor. Luigi needs to battle two Greenies and a Slammer before he can continue. There is a treasure chest on the second floor that can be revealed using the Dark-Light Device. Opening it gives Luigi a robotic bomb that drops five Gold Bars when it detonates. 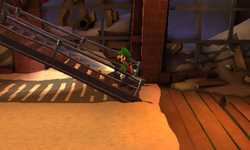 In Play Catch, Luigi can use the Cargo Room as an alternate way to get to the second floor as opposed to using the lift in the Warehouse. During Outlandish Interruption, the Cargo Room might be one of the room infested with ghosts.